Home » Blog » Sports Injuries: Avoid a Broken Tooth in Davidson! 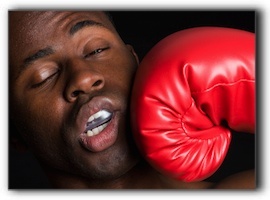 It is estimated that over 5 million teeth are knocked out yearly. A significant portion of dental traumas occur on the playing field or court. Each dislodged tooth requires several trips to the dentist and hundreds of dollars in restoration expenses, not to mention pain! Patients can avoid a broken tooth in Davidson by wearing proper protection on the field. At the office of Dennis J. Coleman, DDS, we want to raise awareness of the importance of athletic mouth protection. We advise our patients to think of mouth guards as an important part of their protective gear. Most parents require their children to wear helmets when biking and shin guards while playing soccer. We encourage parents to emphasize the importance of mouth protection from your child’s very first 5-year-old T-ball game. You are probably aware of the main types of mouth guards: ready-to-wear, boil and bite, and custom-fitted. The stock mouth protectors are pre-formed, but are definitely not one-size-fits-all. These mouth guards probably provide the least amount of protection, though they are better than nothing. You can find boil and bite mouth protectors at local sporting goods stores. They are to be softened in boiling water and then formed to the mouth. For best results, follow the manufacturer’s instructions. Some dentists offer custom sports mouth guards that provide the highest level of protection and comfort. Mouth protectors that are comfortable are more likely to be worn by kids who complain about wearing a mouth guard. Ask your dentist about custom mouth guards. Overall, always remember to use caution whenever it comes to your beautiful smile and to avoid a broken tooth in Davidson. Mouth protection is extremely essential for Davidson patients with braces or fixed bridge work. Some Davidson orthodontists recommend mouth protectors for lower teeth as well. If you or your child has a sports-related dental emergency, call our office immediately. We will do everything in our power to save the tooth, but remember that every second counts. Make sure you save all pieces of the tooth and bring them with you. If you’ve already had a broken tooth for some time due to a sports related injury, ask about our restorative dentistry and cosmetic dentistry programs today!